"Serve a scoop on top of a green salad, or between two pieces of bread with fresh lettuce. Sprinkle a little paprika on top to add a little flavor and color." 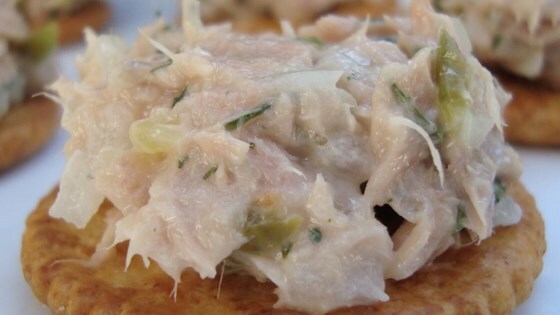 In a large bowl, combine the tuna, celery, onion, mayonnaise, lemon juice, parsley, garlic powder, salt and pepper. Mix well and refrigerate until chilled. Sprinkle with paprika if desired. Best tuna salad I ever tasted. This recipe is amazing. Very flavorful, and definately not fishy tasting. I like it on toasted bread with a thick tomato slice and topped with melted cheese, yum! I made this for lunch today and used light mayo, a bit less than called for actually. It was great - just perfect on whole grain toast.